Twenty-five years ago in 1993, a group of Colorado women, including me, launched a commemoration of the state’s woman suffrage. 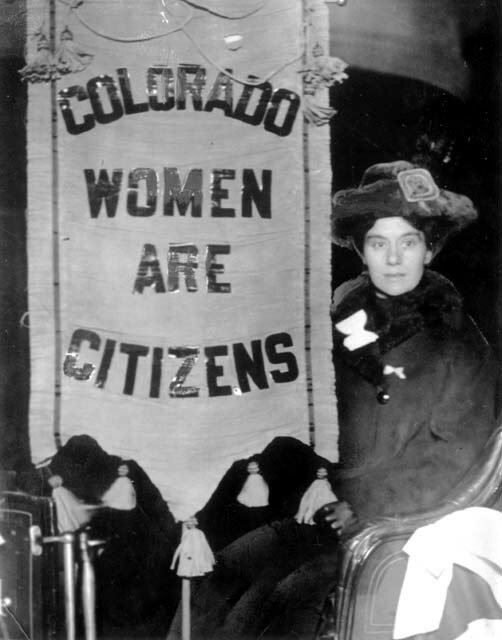 Colorado was the first state to institute votes for women, and it was accomplished by a popular vote. In other words, by men voting to endorse the move! As I became involved with the project, I learned about the history of women’s political efforts. Seems to me in the West in general, women achieved status and power more easily than back East. Perhaps because the Homestead Act of 1862 allowed single, widowed, divorced, or deserted women to file for property. Perhaps because married women on homesteads and ranches had to assume men’s responsibilities and equal amounts of hard duties to keep the holdings afloat. In any case women’s rights came more quickly out here. In Colorado, the movement was helped a great deal by the silver crisis of 1893. Silver was devalued and other economic brouhaha occurred. Then it wasn’t just kindly thoughts on the part of men; it was financial desperation. So much for lofty goals like equality of the sexes. Regardless, the history of the women’s movement in the state is fascinating. The personalities, the strengths and weaknesses, the emotions stirred up make an exciting and educational account. Each iteration of feminism brings its own perspective, extremists, battles, losses, draws, and wins. Cobble together your own interpretation of what was significant, who was a heroine, who a villain.. However, it’s useful to remember any time members of a group are lumped together as identical, the more scope for errors. In the 70s, women protestors were known as “bra burners” when, in fact, this wasn’t a wide-spread phenomena. The respected rumor-debunker Snopes says, During a demonstration by feminists at the 1968 Miss America pageant, some bras — along with numerous other items — were burned when a trash receptacle was briefly set alight.” This was the only occurrence of the symbolic action. Another point: social change doesn’t occur overnight. Years ago, when my children were babies, my husband and I decided that family responsibilities were a benefit as well as a responsibility. We decided to alternate each of our stints at child and house care with employment to support us. This began as a one-year period but quickly extended to two, then five year rotations when we realized no one would hire us for any kind of decent wage if we constantly hopped in and out of jobs. None were true. The first step for our then-unusual transition was my husband’s. When the kids were very little, one day he offered to let me have an entire day a week to do whatever I wanted while he took care of house and children. I pulled out a piece of paper and toted up the number of hours I normally spent on my chores. When I realized the accumulative time was well over ten hours a day, seven days a week, while he was working eight hours a day, five days a week, I surrendered without a complaint. So just as women’s right to vote in Colorado was approved by men, my personal voyage to women’s lib was launched and sustained by a man, my husband. realization that children deserved protection from excessive labor and horrid conditions came from adults. If the #MeToo movement bears productive results, it will occur because people of all genders support it and come together in a spirit of good will. * photo courtesy Denver Public Library Western History Dept. This entry was posted in Events, To Think About and tagged colorado, equality of sexes, history, women suffrage, women's history, women's liberation by Bonnie McCune. Bookmark the permalink. Kudos to you and Patrick for leading the way!! Wyoming was still a territory when they gave women the right to vote in either 1869 or 1870 so they beat out Colorado. Colorado can only claim the first state place because they were a state, but Wyoming in my mind is the winner.